New member here, reposting this from the welcome section of the forum. I'm hoping to get some help with a new to me Ovation that's in need of some serious love. I'd like to see what my options are for getting the guitar back to playable/stable condition. The guitar is a 1768 deep bowl elite. I've been wanting a cutaway elite for a while and finally pulled the trigger on this one on eBay last week. Unfortunately when it arrived I quickly saw that its in terrible condition. The top is severely sunken below the strings, and bellied behind the bridge. The fingerboard drops above the body but is also separated from the top. There is a large crack behind the bridge and a small crack under the strings (this 2nd one might just be in the finish). The guitar is pretty unplayable as the action is sky high towards the heel of the neck. On the good side of things, the bridge doesn't seem to be separated from the top. I took a look inside and didn't see any loose braces or other obvious signs of damage, I think the braces are warped along with the top. I guess maybe this guitar was left in a hot attic with the strings at tension for a long time? I contacted the seller who offered to refund me in full, but it just seemed easier to not ship the guitar back. So I ended up keeping the guitar with a partial (almost full) refund. So I thought I'd see what my options are as it would be cool to get this guitar back into playing condition. I payed almost nothing for it so my other option would be to sell it and try to recoup the rest of my costs, maybe someone else would be more interested in the project. I've done some work on guitars before, but mostly on solid body electrics: (a refret, setup/action including nut slots, a full build including french polishing, and lots of electronics work). On acoustics I've made a new saddle from scratch but not really much more than that. Still, I'm pretty handy (engineer by day) so I'm up for some DIY depending on the complexity/risk. So, what are the options on what can be done for this guitar? Location: Jet City It looks like this top was left in a low humidity environment for a considerable amount of time. I've had a couple guitars with bellying issues that worked themselves out with hydration over a period of time, but yours will need more than that probably, plus the top'll need cleating. Now someone smarter needs to come along and tell me I'm wrong, and or, explain how to do the fix. It could be caused by low humidity. Whatever the cause of the bellying, the top also has a couple of splits in the wood. This could be caused by braces that broke loose and are now allowing the top to distort. The first thing I'd do is take off the strings to relieve the tension on the top. It looks like there are at least two splits in the top. One between the bridge and the lower bout and another between the bridge and the neck. So, the next job would be to take the neck off so you can assess the damage to the upper bout and check for any loose braces. Thanks for the info. Since the fretboard is detached from the top, can i simply unbolt the neck? I guess that will give me another access hole to work though besides the "manhole"? You've gotten great advise already. Thought this would be of interest to you. Three short videos in this series by Bob Taylor demonstrating using hydration to close up cracks prior to cleating. Pretty amazing. Here's the first. The other 2 should auto-follow on Youtube. Also, the floating fingerboard extension is normal. One less thing to worry about. But, if the fret board extension is glued to the top, which it doesn't look like it is, then you can put boiling hot water into a bag, then rest the bag on the fret board extension to soften the epoxy. It'll take three or four bags in succession to heat up the glue enough to soften it, then just use a thin putty knife or palette knife between the extension and top to separate the fret board extension from the top. It could give you more room to work, yes. The main reason is to get the extension out of the way so you see how much of the top is split. Ok, got the neck off without any trouble. Looks like there was a little bit of dried out and detached glue under the fretboard extension - were these things originally glued on or not? Either way the crack in that area seems to go to the fretboard area and then stop right where the glue starts. Its hard to see in the photo but I don't think it goes any further. I also can't see that one from the back, whereas the crack in the lower bout clearly goes right through (I can see right through the top from the back access port. So, next I'm thinking I'll put the body in the case with a humidifier to get everything rehydrated and see where that puts things. Plus I'll check for loose braces. Any tips on that? I guess just see if any of them wiggle plus look for gaps where they attach to the top? Am I right in thinking that with all of this info I'll have a real good idea on if the guitar is repairable, and what that would entail? One other thing I noticed this evening - on the fancy wood that covers the multi-soundholes, on the non-cutaway side, there is a crack in the wood overlay. Hard to tell if the top is also cracked underneath it. It's right on the thin section between the biggest hole and the 2nd biggest hole. You can see it as a bright line in the last photo below. Yes. The early bolt-on necks had fret board extensions that were glued. Later on, Ovation added the floating fret board extension which was attached to the neck. One way to check for cracks is to take the guitar into a darkened area, then shine a flashlight inside the body so that it's pointed to the suspected crack and see if you can see any light shining to the outside through the crack. Another way is to dribble some naptha (lighter fluid) onto the suspected crack and look inside to see if you see any naptha wicking through to the inside. It will darken the wood on the inside, so it's really easy to see. Yep. Just wiggle `em. If you find a suspected loose brace, you can use the same trick with a flashlight or naptha. For loose braces I use thin CA glue. (cyanoacrylate - super glue) I don't recommend the hardware-store variety. I usually use the hobby-store variety, specifically ZAP brand. The thin CA will wick underneath the loose brace due to capillary action and fill all the nooks and crannies. You just have to be careful to not use too much. To control the flow I also buy the Z-Ends, which are tips and thin teflon tubing. To use the thin CA I use the tip with a short piece of tubing inserted into the end like can be seen in the photo below. I think this brand of CA also comes in 1/2 oz. or 1/4 oz. bottles. You shouldn't need that much glue to fix a loose brace. I don't think that crack goes all the way through, but you can always check with naptha. OK I had a chance to check the cracks with Naptha - the one between the bridge and endpin goes all the way through (already knew that). The crack in the upper bout appears to be only through the finish, however. There was only one spot where the naptha soaked through (1/4" circle of darkened wood), and it didn't appear until maybe 2-3 minutes after I put the naptha onto the top. I had a little puddle sitting on top of the crack so I think there was enough. The crack in the upper epaulet also goes through the top. I didn't find any evidence of loose braces. I guess someone must have left this guitar in a hot car or something? Or strung it with too heavy strings. The braces appear to be bowed right along with the top. Thanks for the info about the CA glue though - I have some stuff from Stew-Mac for wicking under loose frets that I think would have worked well if I needed it. So, what are my options here? Can the top be repaired? And if so, what would it entail? DIY? I don't even know if Ovation exists any more - do they do repairs like this (and is that super expensive)? Any other options? I don't even know if Ovation exists any more - do they do repairs like this (and is that super expensive)? Any other options? I saw your Elite on ebay also. I immediately thought "needs new top" and "great price". Since I am involved already with a top job Pacemaker, I passed on it. All the "wood crack" issues with your guitar are fixable, albeit with a good bit of work. Making them invisible finish wise would probably require a stripping/removal and respray. In my experience, heavy finish cracks in Ovation clearcoats are very difficult, if not impossible, to get out perfectly. Your major repair problem, in my opinion, is in the warped braces in the bulge area. A warped/bulged top piece can often be relaxed with humidity/ moisture and clamping, but bowed/warped braces are not easily workable in place on even conventional acoustics, let alone ovation closed tops. I would replace the top. then make and install new braces. Yes, the heavy repair advice might seem grim, but your guitar is in the "lots of work to fix" category, especially if you are trying to put it back to an original condition. Thanks for the good information! I can clarify some things based on your response. First of all, I'm a player not a collector. So what I care about first and foremost is getting the guitar to play and sound good. I'm not really concerned with making the cracks disappear completely or anything, and I don't super care if the guitar is in original condition. Instead, I just want the top to be stable long-term and the action to be correct. Additionally, I've done refinishing before so I'd be comfortable with stripping/reapplying finish if needed. As far as removing the braces and flattening the top, I know that I at least don't have the right tools. Replacing the top sounds way above my skill/experience level. Well, you have helped me understand where you are in your desires for this repair. I tend to look at all repairs from a Luthier's point of view to return a guitar to top, or close to top condition. So let's start from where I know you want to go. plastic coffee can lids in the guitar body. They fit in the ovation access hole easily by slightly bending in half. Lay the sponges in the lids and close up. I would check every 3 days to keep the sponges wet. It can take a couple weeks to get the cracks closed on really dry tops. If you can measure the original cracks with a feeler gauge before you start, then you can measure the progress as the cracks close (if they will). Then cleat them for stability. That should get you started. Once in a rare case, the top bulge will also relax a little with this moisture application. As far as getting the top flat as it originally was, it can be successful sometimes, but those braces are a bear when they are bowed. I ran out of room in the last post. Hope I didn't make matters worse for you. Thanks for the info! I'm afraid we won't be able to get measurements of the top in its original condition, as I've already begun rehydrating it for about two weeks using the technique you've described. The crack on the lower bout is looking somewhat better - judging by how much light is visible through the back of the guitar it has closed up some. Cleating the crack after it finishes closing would be pretty do-able for me I'd say, especially with that convenient access hole right there. As far as the dish/bulge its hard to say if it's changed at all. It feels kind of unlikely that humidy would un-curve those braces but I could be wrong. Do you think it would be possible to remove the braces, re-flatten the top (maybe a combination of humidy/steam and mechanical clamping) and then install new braces? Or would it be impossible to do that without removing the top? One thing I can do still is get some measurements on the dish/bulge right now to see if they are changing at all with more humidity. I'll get back to you with those measurements. I have been thinking about your problems a lot, and using all my experience as a luthier to get at an answer. a creative way to flatten the bulge. The big question is, will the top stay flat after you do it? I have no way to be positive it will. Sometimes trying to re-flatten a top bulge works, sometimes it doesn't. any cleats on the cracks before trying to flatten the top. Is there any flex at all if you press down directly on the bulge? Sorry for being so inquisitive here, but since I do not have the guitar in my hands I can only ask. I have made it a rule never to trouble-shoot over the phone, especially on a big repair question, but trying to help you figure out how to fix this has forced me to make an exception after seeing how helpful the guys on this website try to be with everyone. Thanks again for all of the help! I really really appreciate it. As far as the bulge, yes it flexes some when I press down on it. I haven't tried with the sinking area but I can check it out later today. My thought lately is similar to yours above, that I need to try to re-bend the top into the correct (flat) shape. I'm kind of concerned that I'll damage the top by removing the braces or bridge (the bridge is epoxied on, right? ), so I might want to try bending the top with everything attached first if possible. I was talking to another luthier friend and he had the idea of putting a weight on the area I want to bend (on the outside of the guitar for the belly, on the inside with the body upside-down for the sinking area), and then either adding steam inside the guitar or placing a damp/wet towel in contact with the underside of the top. The idea would be to try to bend the top back into the correct shape similar to how acoustic guitar sides are bent. Of course the danger is that a brace could pop off but that wouldn't actually be the worst thing ever. It'll also be hard to know the correct amount of moisture and weight so I'll have to start small and increase until I see a change. Hopefully I'll reset the wood's shape though and the top/braces will stay flat. This would be pretty non-invasive so I'm inclined to give it a try. What do you think? Another question that somebody here might know: if my efforts to flatten the top fail, I've been thinking I might want to try re-topping the guitar. I've never done that before, but it seems like this guitar's construction would simplify the process somewhat compared to a normal acoustic. It could be a fun project! But, I'd need to get a bridge and the epaulets somewhere - is there a source for those that anyone knows of? Does Ovation sell them? Location: Lake Forest, CA Yes, you should be able to order a bridge and epaulets from Ovation. Ok, let's take a look at some replies by task. In my experience, the less resistance to re-flattening tops, the better. Braces and bridges add strength to a top. So, they also add resistance to bending. Removing them provides the best chance at reversal. But, if you don't want to remove them, give it a shot. Nothing to lose. The biggest(obvious) problem with your Ovation is the lack of a sound hole that could allow you to use clamps. This drives me nuts when I have to do repairs on these particular Ovations. 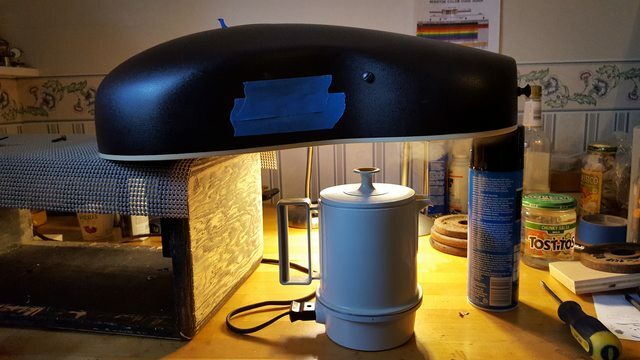 I use a thin blade putty knife and a heat gun. Softens the bridge adhesive right up, regardless of the type. 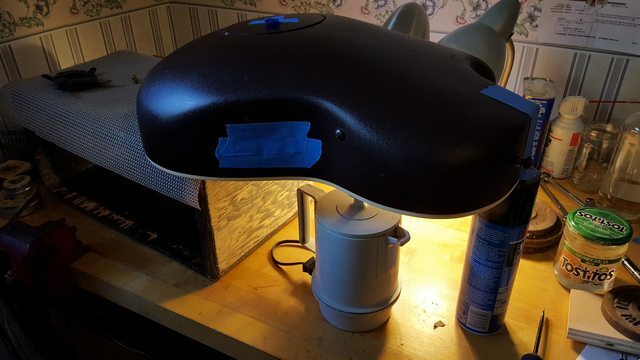 A monokote heat gun used to shrink model airplane covering works fine. Has a nice end on it to fine tune the air. Take your time. Heat the bridge and slowly work the blade under it. I also use this technique to remove fretboards from necks without damage. Check out the jobs done on this website. Dan Savage has some really detailed photos and very helpful info on this task. Also some posts by arumako. I also have a few pics of a job I am doing, but Dan provides more info on his posts. Your guitar has the neck removed, so it definitely reduces some effort. The main concern to top replacement is do you have the tooling to help accomplish this task? It can be done with some basic tools and a creative effort. The operative here is creative and effort. I finally got a chance to work on my guitar a bit. Before any possible top removal/replacement I thought I'd try using some steam to bend the top back into the correct shape. I set up an electric kettle with the spout pointing at the larger group of soundholes. I removed the electronics and sealed up all of the holes in the body. Then I placed a weight on a small piece of wood, resting on the braces where the top is sunken in. After a half-hour of steaming the guitar body was warm and moist inside, and the top appeared to be pretty much straight in the sunken area. It's not going to win any beauty contests since the top between each brace is a little sunken still (since I was only applying force onto the braces), but the braces themselves appeared to bend. Next I flipped the guitar over and repeated the steaming with some weights behind the bridge where the top had risen. I also jammed some wood inside the body to press onto the formerly sunken area on the top, so that it wouldn't bend back. I think this worked too!! I'm thinking next I need to let the guitar completely dry out before reassembly. Is there anything else I should do? And how long to you guys think it'll take to completely dry and regain some structural integrity? It's currently sitting with the top facing up, with the weights still on the top and the brace still inside so that the wood is held into the correct shape while drying. Location: Lake Forest, CA Yes, I would let the guitar completely dry out before reassembly. I would think a week should be okay.